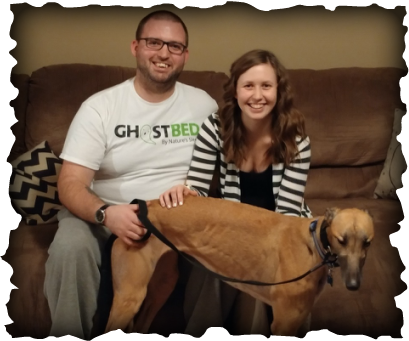 Fairborn residents Missy and Jesse walked into a PetSmart one day looking for items for their cat, met some of our GAGC greyhounds, and fell in love with the breed. They started their research and soon knew they were meant to have a greyhound of their own. Red girl Kay Jade Judy, now called Jade, quickly became a member of their family. Jade is learning to share her new space with 13 year old cat Traine, who chose not to be included in the family photo. We look forward to seeing this trio at future Meet and Greets.